posting on these pages of the author's website. especially students and teachers--and I hope you will do the same. their friendship, and I could not ask for a more knowledgeable board of advisors. keep reading more. Semper Fi. March 27, 2010, email from Charles on San Juan Island . . .
don't know if I've ever tried copying 60 wpm. That's 'way over my head even today! "Thank you, Carol. You created a wonderful piece of work. Many congratulations and keep 'em coming. Should you ever find yourself on beautiful San Juan Island, the coffee pot's always on and at the ready. the Coral Sea and at Midway. World War II similar to yours in the Coast Guard during the subsequent war in Korea. experience--regardless of where or when they served—are essentially the same. 4-11-10: photo and email from Joan--Spokane, Washington . . .
unfolded as they sit side by side, with grandpa wiping tears and choking up trying to speak beyond reading aloud. 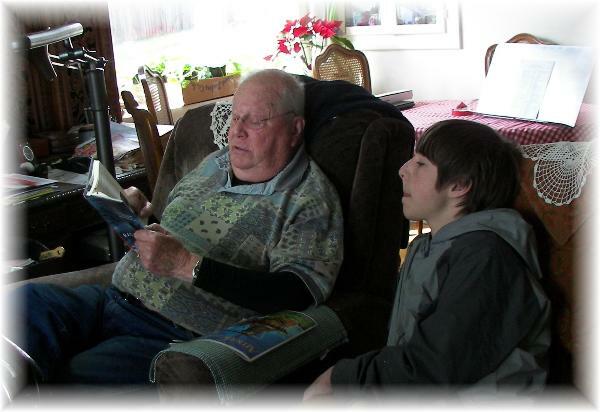 Reading Radioman is a shared experience for Kay and his grandson. See 4-11-10 comment below. May 14, 2010: Email from Mickey--Senoia, Georgia . . . .
infrequently on the verge of tears. Are they both still alive? I would LOVE to meet them if I ever get to the NW. Britain. Thank you soooooo much for this wonderful gem! photographs, historical notes, and time lines--it’s a true story. promised to live until she could hold this story of love and war in her own hands, and she did. Lord in January of 2009. I finished reading your book Radioman just a couple of weeks ago, and I had to write you. gone through physically and mentally during and after the attack on Pearl Harbor. not know until she read the rough draft. Author's Reply . . . .